Hurry! Offer valid from 2nd April to 3rd June 2018 or till stocks last. 1. 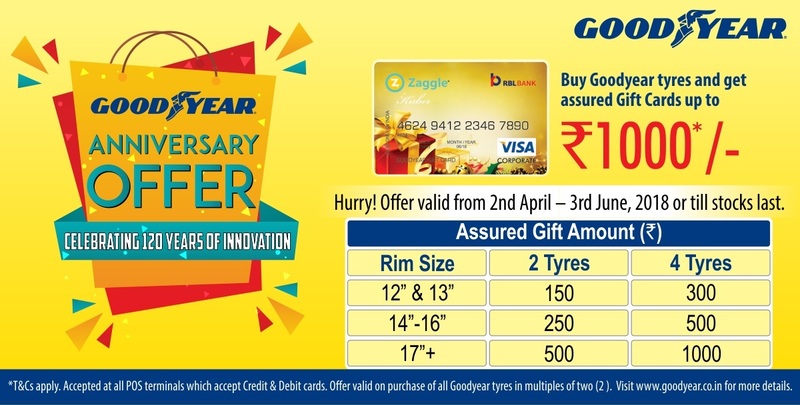 “GOODYEAR – 120th Year Anniversary Offer” (“Offer”) is from Goodyear India Limited having registered office at Mathura Road, Ballabgarh (Dist. Faridabad) – 121004, Haryana, India and corporate office at 1st Floor, ABW Elegance Tower, Plot No. 8, Commercial Centre, Jasola, New Delhi – 110 025, India (“Goodyear”). 2. This Offer is applicable on every purchase of two (2) or more of Goodyear tyres of same specification from the selected size range, as specified in Clause 13 (“select tyres”). Any two different select tyres cannot be clubbed for the Offer. 4. Any consumer purchasing Selected Tyres in the multiples of two (2) or four (4) shall be eligible to receive Zaggle cards. ii. ii. It is hereby clarified that the purchase shall be done at the same time and day. Multiple purchases done on different days shall not be clubbed together. 5. This offer is applicable to all Goodyear Dealer/ Distributor (as a offer on consumer tyres mentioned in clause 13). 6. Goodyear may at its sole discretion vary/amend/change the eligibility criteria, terms and conditions etc. for the Offer, without providing any reasons thereof. 7. Goodyear reserves the exclusive and unconditional right to withdraw/ suspend/ cancel this Offer without prior notice and without assigning any reasons thereof. 8. Goodyear’s Associates (employees), Channel Partners (i.e. Dealers, Distributors and Associate Dealers) are not eligible to participate in this Offer. Goodyear’s decision in this regard shall be final and binding on all. 9. The Gift under this Offer is non-negotiable and non-transferable. 11. Consumer escalations and disputes, if any, shall be subject to the laws of India and jurisdiction of Delhi/ New Delhi Courts only. 12. 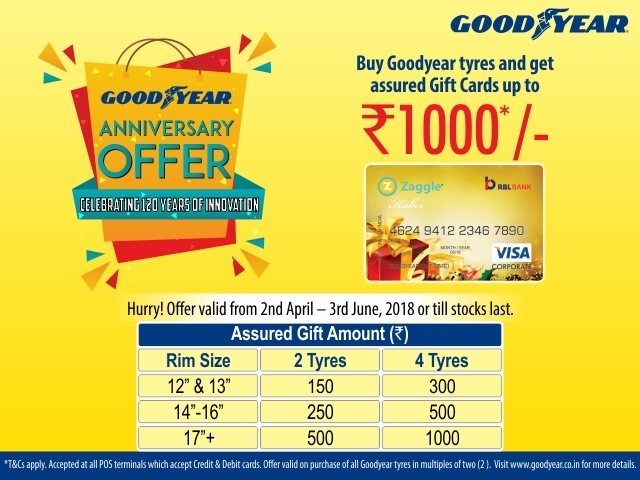 For more information visit: www.goodyear.co.in or please call us at 1800-266-6767 (Monday to Saturday) from 10 a.m. to 8 p.m. or write to us at: goodyearindia_marketing@goodyear.com.